A vintage Kins-shot to start the post; I found lots of old pics on our external hard drive, so I saved some to include in posts for you. 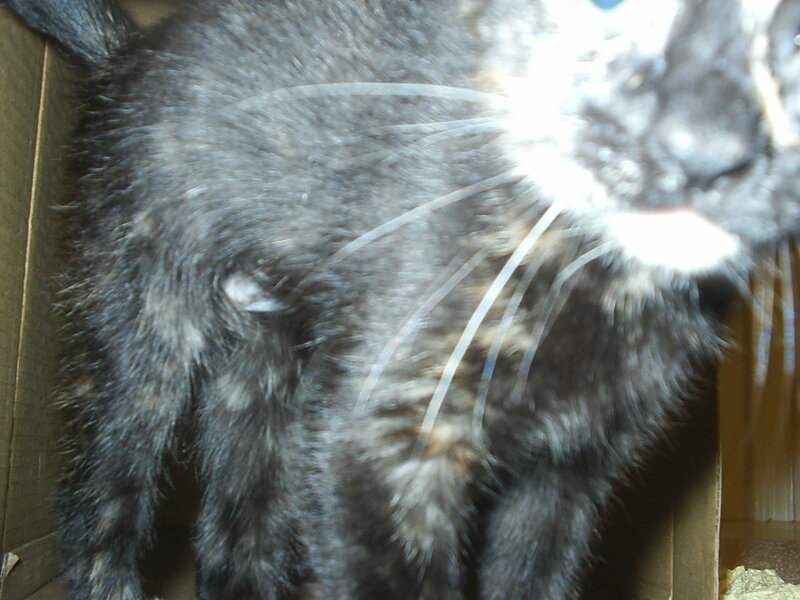 This one was particularly cute, I think…Shelli was very interested in the camera. you can also see her little shaved belly; they spayed her at six weeks; sometimes they do that to help them be more adoptable. It helped us a lot because we couldn’t have afforded the spay fee. I don’t feel like talking about food today. Suffice it to say that I had too much of it yesterday and the day before and that I’m pissed about that and plan to eat extremely cleanly for the next week at least. Also suffice it to say that I’ve learned a very important lesson about being a vegetarian at omnivore family gatherings: I will need to bring a very good veggie dish to every one I go to. Green beans? Cooked in beef stock. Turnip greens? Same thing. My options? Potatoes, potatoes, potatoes. I’m sick of them. Anyway, on to other things. One of the most fundamental aspects of voluntary simplicity is the idea of “minimalism,” or reducing one’s possessions down to what is absolutely necessary and/or important. Possessions should reflect one’s values, and those values should not include amassing as much “stuff” as possible. One of the first steps, I daresay, into a more simple life is taking inventory of one’s possessions and paring them down to the important stuff. We’ve done this a few times; we’ve had two or three yard sales and have made decent money, but we’re still really bad about keeping stuff because “we might need it later.” I’m over that. We have an office that we can’t even get into, and the dresser in the bedroom is so covered with junk that I have to stand on tiptoes to put my hair in a ponytail in the morning. Our mission for the next few weeks is going to be to get those rooms cleared out. getting the bedroom closet so that we can store clothes in there again. Now, anyone can “clean.” The point of the minimalist-driven clutter project is to take a very hard look at EVERY item and asking oneself whether or not it’s really that important. Have you used it in the last three months? four months? If not, then you probably want to sell it, donate it, or chuck it if you can’t do anything else. Don’t be overly sentimental; just let it go. If you need help mustering up the courage to start, check out Far Beyond the Stars. This guy is extremely serious about the minimalist lifestyle, to the extreme. While the lengths to which he goes may not be for everyone, his philosphy is something that can really be taken to heart, and his tips are worthwhile, regardless of what level you’re comfortable taking them to.